This exquisite sterling silver Queen Mary Luckenbooth pendant is from the Scottish Celtic Revival period. 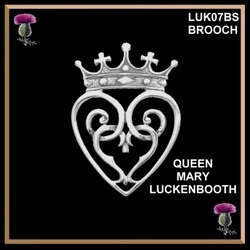 This design features the traditional Luckenbooth motifs, two hearts intertwined for love surmounted by a crown for loyalty to Mary Queen of Scots, thus it's name. We also make this piece in 10K and 14K gold. Click the button below to see the gold version of this antique design Luckenbooth. This beautiful traditional pendant measures 1-5/8"long (42.mm) by 1-1/8"wide (29mm) and includes a high quality 18" chain. This beautiful traditional pendant measures 1-5/8"long (42.mm) by 1-1/8"wide (29mm) and includes a high quality 18" chain. 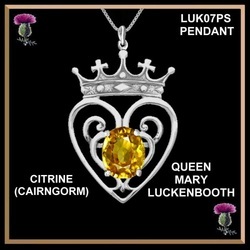 Cairngorm (Citrine) stone. 12mm x 10mm. 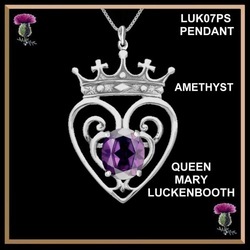 This beautiful traditional pendant measures 1-5/8"long (42.mm) by 1-1/8"wide (29mm) and includes a high quality 18" chain. 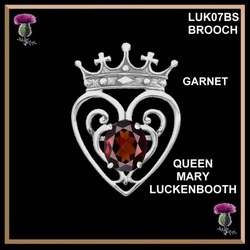 Garnet stone 12mm x 10mm.